Sinema's victory gives the Democrats two pick-ups in the 2018 midterms, as the race was for the spot being vacated by Republican Sen. Jeff Flake. Democratic Rep. Jacky Rosen (D., Nev.) also beat Sen. Dean Heller (R., Nev.) in Nevada. "I have never been into politics until this year," said Oralia Ochoa, 26, a first-time voter who cast her ballot for Ms. Sinema and other Democrats. "It all has to do with Trump and what’s going on." Ms. Sinema started out in politics as a liberal activist and spokeswoman for the Green Party. She shifted to the center after winning a seat in 2012 in the House of Representatives, drawing criticism from some on the left for siding with Mr. Trump and other Republicans on some legislation. Shortly after McSally called Sinema to concede and congratulate her, she posted a video on Twitter with her dog announcing her setback. "Congrats to @kyrstensinema. I wish her success. I’m grateful to all those who supported me in this journey. I’m inspired by Arizonans’ spirit and our state’s best days are ahead of us," the tweet read. "Hey everybody, I just called Kyrsten Sinema and congratulated her on becoming Arizona's first female senator after a hard-fought battle. I wish her all success as she represents Arizona in the Senate," McSally said. "And I also want to say thank you to everybody who supported me in this campaign, my staff and volunteers and everybody who voted for me." "I'm so grateful for you as my wingmen and wingwomen in this journey. We sure wish it came out with a different result, but I'm so thankful for you. 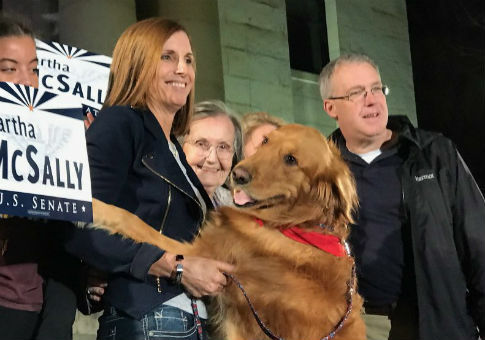 As I traveled around this state I was so inspired by the many people that I met and I am convinced that Arizona is the best state in the country and our best days are still yet to come and I'm going to continue to pray for our success," McSally concluded. Flake will leave the U.S. Senate after one term. He has been a frequent critic of President Donald Trump and questioned the direction of conservatism and the Republican Party under his leadership. This entry was posted in Politics and tagged Arizona, Jeff Flake, Kyrsten Sinema, Martha McSally. Bookmark the permalink.